Recently I saw my girl Leina do this tag video and I thought it was a really great idea - 5 Products I can't Live Without. Many of the products I mentioned are holy grail items that have made it to my Favorites List. I've repurchased each item and plan on using them for years to come. Onto the favorites! Some of these items were sent to me from review and some I discovered on my own. Sometimes people get skeptical if you were sent an item. However, I love trying out new stuff because it gives me access to items I might not have picked up. Bottom line is that after I found these items, I repurchased them time and time again with my own money - that shows how much I love them. Aquaphor - I've been using this as a lip moisturizer for years. My lips get super dry and can really hurt if I don't have this on hand. I've tried the generic versions as they don't even come close. 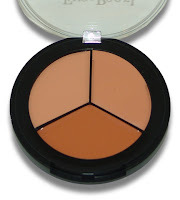 Eve Pearl Salmon Corrector - This is a serious must have in my kit. I use it on nearly every client to eliminate undereye darkness. I love that it comes in individual pots (for personal use) or in this palette for Pros. 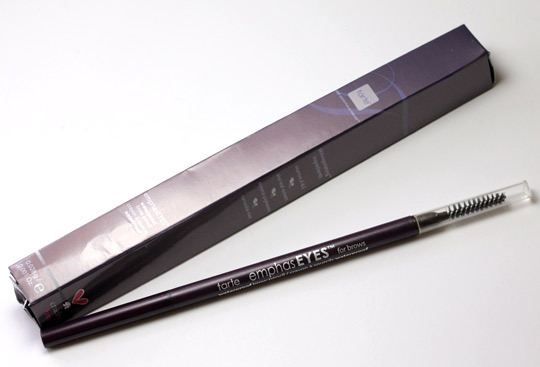 Tarte Emphaseyes Brow Pencil - This is my holy grail brow pencil. You can't beat the color, consistency and application. Love love love it! Preo Individual Eyelash Curler from Alcone- As an avid false lash wearer, I find that this individual lash curler has changed my life. It really eliminates sagging lashes and makes sure that your own lashes aren't pointing straight down (difficult with my straight, thin lashes). I use this on clients all the time too. Revlon Lash Adhesive - Bottom line, I haven't found a better lash glue. The brush applicator makes glue application so much easier. The formula is clear yet not shiny, and the hold is super strong. It stays in my makeup bag...I just wish there was a way so that the glue didn't clump up around the cap because after a while it makes screwing and screwing it difficult. Nonetheless, I would definitely be sad if they discontinued this product. Black Eyeliner - I know I'm over my 5 item limit, but I also can't live without black liner - in pencil and liquid form. I'm not set on any particular brand but it's a total must-have in my personal makeup bag. What are some of the items you couldn't live without? Let me know in the comments below! I LOVE AQUAPHOR HEALING OINTMENT!!! fantastic product! I bought the individual eyelash curler at IMATS this year, but I'm not that sure how to use it. Every time I try to use this I feel like I'm not doing it right & don't see any results. I mainly want to use this for the lashes on the outer part of me eye since they tend not to curl with a regular eyelash curler. I'm using accutane to clear my skin right now and it's seriously drying out my lips, but aquaphor is my saving grace! I love it, it also heals tattoos super quick! I will be buying me some aquaphor for my lips bc nothing is working & I refuse to use carmex!